Taking refuge is central to Buddhist teachings and practice. It’s referred to as “entering the gate”. When we come to understand that taking refuge means that we are working on ourselves, then we understand that it’s a process of changing the directions of our lives. We work on ourselves by doing the practices that the Buddha taught to help us overcome the poisons of greed, hatred, and delusion. We call it “taking refuge” because it is an active practice. Refuge isn’t something that happens to us. It’s something we decide to do. We are actively dedicating ourselves to walk the path. We can’t have someone else walk it for us. It’s easy to study Buddhism and to debate minute aspects of Buddhist philosophy. When we take refuge we are resolving to walk the path with diligent effort. The Dharma is something we are learning about. But it’s also something we are becoming. Central to taking refuge is seeing the direction our lives are heading in. Do we want to continue dwelling in delusion or do we want to take steps to see things as they really are, to dwell in our Buddha nature? Let’s purify our minds at all times, walk the path by our diligent effort, Awaken to our true nature, realize Enlightenment in our minds, and deliver ourselves by observing moral teachings. There are five kinds of incense in the teachings. The first is Sila Incense, which means that our minds are free from the taints of misdeeds: jealousy, avarice, anger, and hatred. The second is Samadhi Incense, whiche means our minds aren’t disturbed in circumstances, whether positive or negative. The third is Prajna Incense, which means our minds are free of impediments, that we look within for our true nature and refrain from doing evil deeds. That we treat others with respect. The fourth is the Incense of Liberation, which means that our minds are in a free state, that we cling to nothing and don’t concern ourselves with duality. The fifth is the Incense of Knowledge, which means we have learned about the Attainment of Liberation. When our minds don’t cling to duality then we attain this knowledge. We should broaden our knowledge so we know our own minds, thoroughly understand the teachings of Buddhism, be kind to others, let go of the idea of ‘self’ and that of ‘being’ and realize that our true nature is oneness. This fivefold incense burns within us. ‘May we, students, be always free from ignorance and delusion. We repent for all of our misdeeds committed because of ignorance and delusion. May we never commit such misdeeds again. May we be free from the taints of arrogance and dishonesty. We repent for all of our arrogant and dishonest behavior. May we be free from the taints of envy and jealousy. We repent for all jealous and envious behavior. This is what we call formless repentance. Living beings are numberless, I vow to save them all. Confusions are countless, I vow to cut them all. The Buddha’s teachings are limitless, I vow to penetrate them all. The Buddha’s way is highest, I vow to achieve it. These are called the Four Bodhisattva Vows. They are considered the fundamental vows of the Zen Buddhist path, expressing our resolution to attain Enlightenment in order to help all beings. These are chanted daily in Zen temples and are often chanted at the closing of different kinds of ceremonies. With the aid of Right Views and Prajna the barriers raised by delusion can be broken. Then we can deliver ourselves by our own efforts to Enlightenment. We take Enlightenment as our guide, because it is the culmination of virtue and wisdom. We take the Dharma as our guide because it is the best way to get rid of desire and delusion. We take Purity as our guide because it is the noblest quality of beings. These represent the Three Jewels. The Sangha stands for Purity. Taking refuge in Enlightenment is the culmination of virtue and wisdom. Taking refuge in Devotion to the teachings helps us become free of wrong views. Taking refuge in Purity means that in any circumstance we are not contaminated by delusion. Practicing the Threefold Guidance in this way really leads to taking refuge in our own Buddha nature. Taking refuge in the Buddha within yourself doesn’t entail taking refuge in something outside ourselves. Let us each take refuge in the Three Gems within our minds. Going for Refuge: Initiation in the Buddhist Tradition. Going for Refuge is an initiation in which one officially becomes a Buddhist. It’s a rite of passage ceremony that marks a formal commitment. We don’t have to make this official commitment, of course, but it serves to solidify our sense of purpose. We go for refuge because we are determined to overcome our suffering and help others overcome their suffering. Like any other rite of passage, it indicates that we are undergoing a transformation. We’ve almost lost rites of passage in the modern world, but they were really important in traditional societies. The only rite of passage I can think of that’s normal in modern society is getting married, or, put another way, marriage vows. For this reason, Going for Refuge is sometimes referred to as Taking Refuge Vows. This terminology, I think, is just to remind us that this is a big deal. Unlike marriage vows, though, when we take refuge, we aren’t making a promise to someone else. We’re really only making a promise to ourselves. When we take refuge we acknowledge—in a formal way—that our goal is Awakening. When we take refuge we become as one with all of the Buddhist lineage that came before us, we become the Buddha’s sons and daughters. When we go for refuge, we are taking refuge in three things, which are referred to as the Three Jewels. They’re called jewels because we are supposed to think of them as precious and valuable. 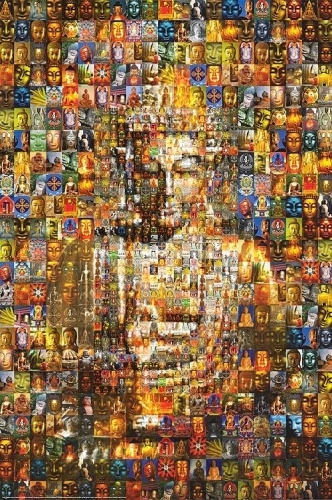 These are: The Buddha, The Dharma, and The Sangha. The Buddha refers to the historical being—Siddhartha Gautama—who found Awakening and who exists as our example to follow. Sometimes when people first hear about Buddhism they think the Buddha is a god. This is not correct. He is our teacher, the one who’s example we follow. Going for refuge in the Buddha also represents the ideal of Buddhahood. We see the Buddha as our example and we committed to achieving Awakening, just as he did, for the sake of all beings. The Buddha transcended his delusion and engaged with his true nature. We seek to do the same by following his example. The Dharma is the roadmap to Awakening that the Buddha gave us. It represents his effort, and the efforts of other great Buddhist teachers after him, to put the teachings into words. He gave us a list of instructions that he summed up as: “Learn to do good, cease to do evil, purify your heart.” A list of simple goals, but certainly something we can spend a lifetime trying to do. Going for refuge in the Dharma means using these teachings and methods to try to increase our mindfulness and kindness as much as we can. The Sangha is the spiritual community. The Buddha once said that spiritual friendship is the most important aspect of the path. Engaging the practice with others means something to us. This is important because Buddhism isn’t simply a philosophy or belief system. It’s something we do, like having a buddy to go work out with, and having a community on the path with us helps. It’s not that we can’t practice alone, of course we can, it’s just like an uphill battle. In a narrow sense a Sangha is any spiritual community that we join. In a broader sense, Sangha represents all Buddhists. In a even broader sense, I like to think we can included all like minded spiritual seekers as well, so to me Sangha can easily include some Taoists, Shamans, or Pagans. So, when we take refuge in the three jewels we begin to transform immediately. By making this commitment we resolve to practice Buddhism, rather than just studying it or thinking about it. If you want a formal ceremony, you’ll need to find a qualified person to perform it. Search for Buddhist teachers in your community. Most communities have a few.